Did you get billed for bulk waste? Bloomington has ended their “grace” period for bulk waste. If something is on the curb in front of your house and they pick it up, a charge will be added to your bill. The problem is they can’t prove you put it there! I hear they used to at least take pictures, I’ve also heard now they don’t. A neighbor who doesn’t like you could pile their junk in front of your house. Somebody from two streets away could dump their stuff in front of your house. It’s up to you to protest the charge. 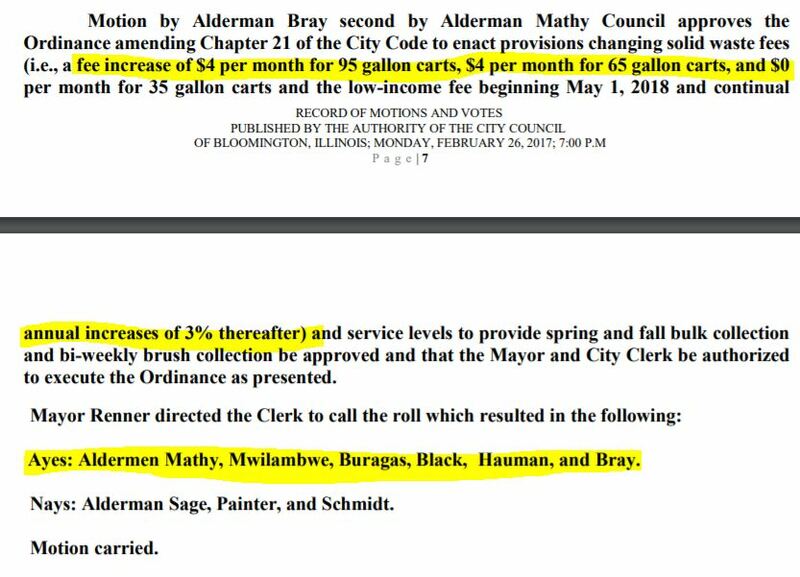 Keep in mind: This Council voted for twice a year pickup and still raised garbage rates. They even voted for rates to automatically increase every year so they never have to vote again. Meanwhile, the City has spent money fixing up the convenience drop off center. The library wants to expand using at least part of that property. The library will raise taxes to build, then Public Works will have to spend to relocate – likely another tax increase. Do you really think voting in LOCAL elections doesn’t matter? At least 80% of registered voters do since they rarely show up to vote! Citizens deserve the government they didn’t bother to vote against. Posted in - - - Please Contribute - - -, BloNo, Bloomington, BLOOMINGTON CITY COUNCIL, elections, Local, Progressives, Renner, Taxes. Throw it in Renners yard..
I’m starting to notice a LOT more trash in the country ditches. I just saw 3 TV’s in the ditch just off Wildwood camp road the other day. Wonder what the added increase will be when the Dump officially closes now that it’s very close to capacity? Havent hesr DC this mentioned yet altho thet all know it’s coming very soon! If we didn’t have a NIMBY attitude about landfills, I expect the cost increase wouldn’t be nearly as much. I know at a recent meeting it was mentioned that Urbana’s costs roughly doubled since they have to ship their trash to who-knows-where. I think they should use it to build mountains! Call it economic development. Why not have community service hours at the dump? Sign a waiver and get 2-for-1 credit on hours as well. For every day you spend there taking trash, filling it with recycling material, and helping fill up a truck, you can knock 2 days off a sentence. Perhaps something to do with inmates. 2-for-1 credit off your sentence up to X days. Perhaps the town could also pull scrap metal out of there too. Sell it to Morris Tick and put it towards the solid waste budget. i’m thinking skiing in the winter. Trash to Treasure competitions in Downtown’s Cultural District. Heck, they ski in Dubai, why NOT UPTOWN?? Turn the Marriott into a ski resort “destination” like THEY want UPTOWN to be! At least they’d have SOMETHING worth going to in UPTOWN.. other then MM’s.. If the city picks up your thrash and bill you. Just call them up and tell them you didn’t put it out. They can’t charge you. Tari and the council members who said yes to this should have the garbage dumped at their houses. Next Post Time to protest your assessment!